Modi is the first Prime Minister of India who was born in 'Independent India’, that is, post-August 15, 1947. He is also the first Indian prime minister whose mother was alive when he took office. He holds the record of winning a Lok Sabha seat by the highest margin (about 5.70 lakhs; Vadodara). 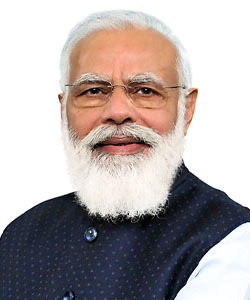 Narendra Modi is the current Prime Minister of India. He represents Varanasi constituency in the Lok Sabha. He is the most prominent leader of the Bharatiya Janata Party (BJP). He is considered a master strategist for his party. He has been the Chief Minister of Gujarat for four consecutive terms. Education Did his schooling from Vadnagar. According to his teachers, he was an average student but had great interest in debates. Achievements Modi is the major force behind Gujarat's position as a global brand and a great industrial destination. Narendra Damodardas Modi was born to a family of grocers in a town called Vadnagar in Mehsana district of Gujarat. He was born on 17 September, 1950 to Damodardas Mulchand Modi and Heeraben Modi. The couple had six children among which Narendra Modi was the third eldest. Modi completed his studies against all odds. His saga of struggle began when as a teenager, he, along with his brother, used to run a tea stall near a railway station in Ahmedabad. He did his schooling from Vadnagar and obtained a master's degree in Political Science from Gujarat University. One of his school teachers described him as an average student but a brilliant debater. During his college days, he worked as a 'pracharak' (promoter) of the Rashtriya Swayamsevak Sangh (RSS). He left home at the age of 17 years and travelled across the country for the next two years. At a later stage, during the 1990s, when Modi served as the official spokesperson of the BJP in New Delhi, he completed a three-month long course in the US on public relations and image management. One of his brothers, Somabhai, is a retired health officer who now runs an old age home in the city of Ahmedabad. Another of his brothers Prahlad, an activist on behalf of fair-price shop owners, has his own fair-price shop in Ahmedabad. His third brother Pankaj is employed with the Information Department in Gandhinagar. Narendra Modi always had the utmost zeal and enthusiasm to serve and help the people in need. As a young boy, Narendra Modi offered his services voluntarily to the soldiers at the railway stations during the Indo-Pak war in 1965. He also served affected people during the 1967 Gujarat floods. Modi started working in the Gujarat State Road Transport Corporation’s staff canteen. Eventually from there he became a full-time proponent and campaigner, commonly called a 'pracharak', of the RSS. Modi later underwent training at the RSS camp in Nagpur. It is a prerequisite for any RSS member to take up the training course for holding any official position in the Sangh Parivar. Narendra Modi was given charge of the student wing, which is better known as Akhil Bharatiya Vidyarthi Parishad (ABVP). His contribution to the Anti-emergency movement impressed senior political leaders. As a result of this, he was eventually appointed the regional organiser of the newly-formed Bharatiya Janata Party in Gujarat. Narendra Modi was an efficient organiser from a very young age. During the Emergency, he arranged for covert circulation of RSS pamphlets and also organised protests against the Emergency rule. During his RSS days, he met the two Jan Sangh leaders, Vasant Gajendragadkar and Nathalal Jaghda, who later founded the state unit of BJP in Gujarat. In 1987, the RSS deputed Narendra Modi to politics by recommending his candidature in the BJP. Modi’s efficiency was recognised and he rose to prominence after managing the Ekta Yatra for Murli Manohar Joshi.